Which is more important when running an advice business: being effective, or being efficient? The correct answer is that you have to balance both. In days gone by plenty of people could build a business just be being effective, but were pretty inefficient. They were fabulous at landing clients and getting revenue in the door…and the rest sort of looked after itself. Or didn’t. Then there were the efficient, who were so diligent and assiduous that they got by even though there were far less clients coming through the door than competitors seemed to have. Those who are not terribly effective are incredibly busy being busy doing stuff, and doing that stuff very well usually. And they flame out because of it. Too few customers with superbly detailed and compliant plans which are wonderfully well researched…and not enough people in the market they are working in want it. It has never been more important in the advice professions to balance both right. Strategy is is critical to getting the direction right, and to ensure that the effort and resources are being applied to the right things that drive the business results. The tactics, or execution of the strategy, is about doing it right. The objective is ultimately to be doing the right things the right way. Doing things right isn’t enough….your business will struggle to survive. Doing the right things isn’t enough if you aren’t doing them well. You’ll get by…survive…but that is it. 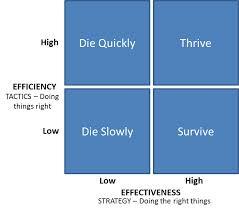 To thrive you have to get the strategy for the business right, and then execute it right. You need to balance both.